This exciting new book demonstrates how to seamlessly integrate effective questioning strategies into daily practice, thereby energizing teaching and learning. "Questions are the most important tool in a teacher’s toolbox. Walsh and Sattes teach us how to sharpen those tools and use the right ones to maximize learning. They understand that questioning isn’t interrogation, but rather frames dialogic instruction. You can see this come to life in the videos throughout this book! Quality Questioning belongs on every thoughtful educator’s bookshelf." "If you’re ready to shift your purpose for questioning from answer-getting to provoking higher-order thinking, this book is a must-read. Never again will you take questioning for granted." "Reading this book is like chatting with an amazing professional friend and mentor. It’s a joy to read, to ponder, and to use as a constant resource. "A must-read for all teachers who continually strive to improve their practice to better impact student learning." Chapter 1. Setting the Stage: What Is Quality Questioning? Chapter 2. Prepare the Question: What Are the Distinguishing Features of Quality Questions? Chapter 3. Present the Question: How Can Teachers Engage All Students in Thinking and Responding? Chapter 4. Prompt Student Thinking: How Can Teachers Assist Students in Making Connections? Chapter 5. Process Responses: How Can Teachers Use Feedback to Deepen Student Thinking and Learning? Chapter 6. Polish Questioning Practices: How Can Ongoing Reflection and Dialogue About Classroom Questioning Improve Teaching and Learning? "In reviewing standards and performance assessments for CAEP accreditation, questioning strategies stand out. The second edition of Quality Questioning will help our students fully understand both why and how effective questioning impacts student learning. From foundation courses and field experience through student teaching in prek-12 schools, our students will find this book useful. I love the inclusion of videos that show teachers using these questioning strategies in their classrooms because our students can immediately begin using the research-based strategies from the book. As students develop their own performance assessment videos, Quality Questioning 2e will be a definite help, providing useful examples. This book that will have a long and useful life and will never be packed away or left unused!" "Jackie Walsh and Beth Sattes have a near-legendary history in their work to bridge the art and science of quality questioning. If an artisan is one who hones his craft toward perfection and a scientist one who searches for truth, then Walsh and Sattes are artisans and scientists. Add to this their unsurpassed experiences as premier presenters for adult learners and we have a book that guides classroom teachers through a careful yet practical process for student achievement. By embedding the notion that students are partners throughout the “6Ps Framework,” the authors put power in classroom learning experiences. By following their adept and practiced suggestions, teachers will see increases in the rate, degree, and transfer of student learning." "Quality Questioning is an incredible resource for teachers who wish to maximize the impact of questioning in their classrooms. Through passion and experience, Walsh and Sattes outline a 6Ps framework that teachers can readily integrate into their practice. They offer a compelling research base along with thoughtful prompts that encourage collaborative teacher thinking and reflection. This book is beautifully written and highlights student voice and partnership in learning, making it an important read for all educators." "Questions are the most important tool in a teacher’s toolbox. Walsh and Sattes teach us how to sharpen those tools and use the right ones to maximize learning. They understand that questioning isn’t interrogation, but rather frames dialogic instruction. You can see this come to life in the videos that accompany this book! Quality Questioning belongs on every thoughtful educator’s bookshelf." This research-based work, like the authors’ previous books on quality questioning, is both practical and innovative. Teachers and administrators in our district have used the authors’ earlier works to impact student outcomes in our schools. This latest book is better than ever. We look forward to using it as a resource to build on previous successes that have resulted from more intentional use of quality questioning strategies. "All educators use questioning, but few use a thorough cycle of questioning that engages learners, deepens student thinking, and provides formative feedback to the teacher and students. If you're ready to shift your purpose for questioning from answer-getting to provoking higher-order thinking, Quality Questioning is a must-read. Walsh and Sattes relate quality questioning to 12 of Hattie's top 50 areas that actually work to improve learning, including metacognition, peer learning, and teacher-student relationships. Never again will you take questioning for granted." "Read this book and discover the art and craft of quality questioning. Jackie and Beth have masterfully provided the perfect balance between the purpose, process, and practice of quality questioning. They demonstrate the important role students play in bringing quality questioning to life, optimizing the possibilities for cognitive engagement—the heart of meaningful learning. Their first edition was impressive; the second is simply exquisite." "In their second edition of Quality Questioning, Jackie Walsh and Beth Sattes have built on their earlier classic. Reading this book is like chatting with an amazing professional friend and mentor. Utilizing a multitude of current and seminal research on questioning, teaching, and learning, each chapter models their practices of questioning to improve instruction. The authors invite us to think and talk with colleagues about the phases of quality questioning and instruct us to review and reflect on personal practice. In each chapter the reader is encouraged—and taught how—to interact and partner with students to create a classroom of intuitive, inquisitive questioners. The authors pepper the book with specific and usable instructional strategies with specific content examples. This book is a marvelous resource for both the individual teacher and professional communities wanting to improve their students’ thinking and learning skills. It’s a joy to read, to ponder, and to use as a constant resource." "Almost three years ago, as an elementary principal, I read the first edition of Quality Questioning, collaborating with a successful teacher to read, reflect, and dialogue. Our discussions prompted major shifts in our thinking about student engagement through the vehicle of quality questioning. Over the past two years, we have worked collaboratively in our district to understand and use Quality Questioning on each school campus. Our journey has involved learning and reflection as we made the commitment to improve student engagement and produce higher levels of student learning. 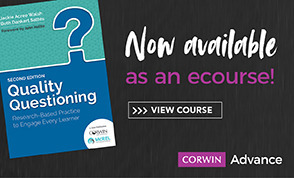 This second edition of Quality Questioning will enable all educators to make this journey; the research base is more rigorous and the video examples very helpful for seeing questioning practices in action. Our teachers have learned to become more collaborative and more intentional as they plan questions, consider how students may respond, use alternate response structures to engage more students, and reflect together on student learning results. As a 25-year veteran educator, it is a joy to see the most successful, veteran teachers shift their thinking and practices to improve student learning." A complete guide to using effective questioning in the classroom to build higher-order thinking skills and student achievement.